Lauren bought one item (a short blond wig) and a costume was made. Nobody knew it was Lauren when she walked into the Halloween party wearing this costume put together with a black “posh” dress and high stilettos in Victoria’s signature color. Dark sunglasses helped her hide from the paparazzi, but if you look closely you will know who she is by the statement tattoo going down the back of her neck. It doesn’t hurt to play off your man’s strengths in putting together his costume as well. Scott is a soccer player just like Beckham and enjoyed having his soccer ball (prop) with him out that night. Matching blond wigs and hot pink heels were the finishing touches to our Barbie costumes. 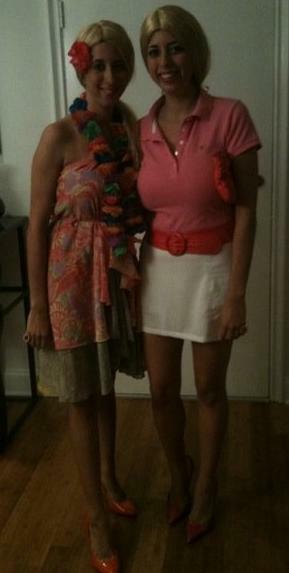 We had so much fun going out as Malibu Barbie and Country Club Barbie and Ken. Kourtney and Kim take LA. Why not dress up like these Reality TV sisters, people often tell us we remind them of the Kardashians anyway. Last year, we didn’t have to buy anything. We just played up those Kardashian curls and Kourtney’s pregnant belly (although our one mistake was to not buy the costume shop plastic pregnant belly as you can see). Scott also played his role extremely well in his preppy get-up as Kourtney’s beau (it helps that he didn’t have to change his name). We like to keep our Halloween costumes relevant. After weeks of discussion on what to be this year (Kate Middleton and Prince William? Rachel Zoe? Holly and Wood? ), we finally came up with our idea the day before dressing up. Talk about waiting ’til the last minute. The guys wouldn’t go for the cast of Glee so we decided to do Entourage instead as an ode to its final season and ended up getting a whole group involved. When dressing up as characters from a TV show, we use google images to find costume inspiration. 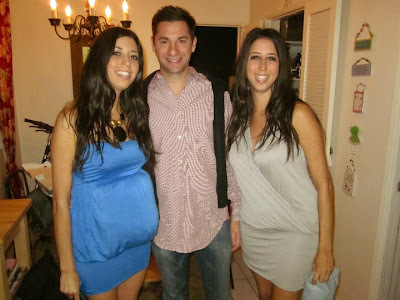 We did our best to recreate Eric (“E”), Sloan, and Sophia’s outfits from items already in our wardrobes. In fact, the only costume shop item we used this year was this blond wig. Ari and his on again off again wife pose in their every day work clothes; a three piece suit, hot red dress, and patent leather pumps. The Entourage boys are back together again (from left: “Drama”, Vince, “E”, and “Turtle”). We would love to hear what you dressed up as this weekend or what you are dressing up as tonight. Happy Halloween! 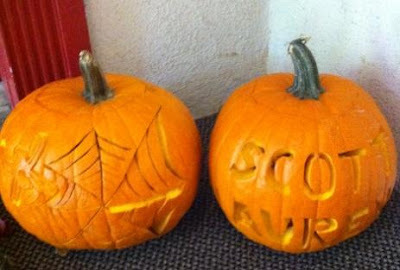 Pumpkins look great with elaborate carvings like this spider and web design or a more simple look like this couple’s name cutout. Spray paint your pumpkin in bold or metallic colors and then do your carving. 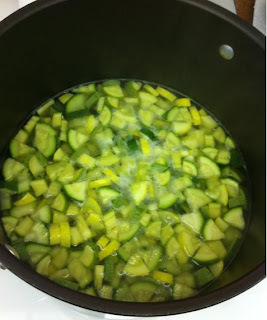 This will make a statement as well as accentuate small details with a pop of orange. This year, Lauren went simple; “S” is for her new husband, “L” is for herself, and “G” is for the new last name they share. Using different fonts creates interest. Draw and cut out more complicated designs to trace onto pumpkins for better results. 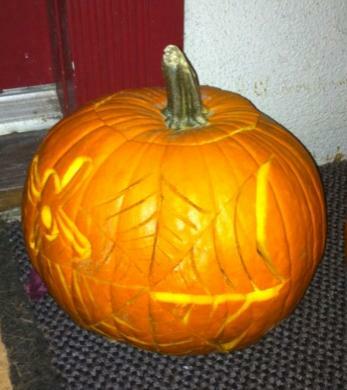 Whether by yourself or in a group, carving pumpkins is always a fun October activity. 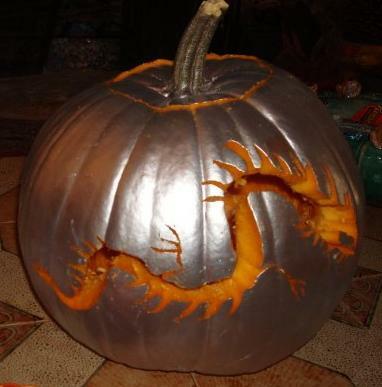 Why not invite your friends and family over for a pumpkin carving party? This is a great way to get tips and ideas for your own pumpkins while spending time together and munching on baked pumpkin seeds. According to www.ask.com a ketubah is, “The Hebrew marriage contract dating back to ancient times. The ketubah is usually printed in a very beautiful, artistic, and creative way as a keepsake document for the Bride and Groom and an heirloom to pass on.” Many couples choose their wedding ketubah in the same way they would choose a piece of art for their home. Lauren decided to make this special document her own by making it one of her wedding DIY projects. This piece of hand painted wallpaper was Lauren’s inspiration and used as the backdrop for this project. We like the contrast of this simple, glossy, white frame with the antique style of the wallpaper. There is also a small frame around the text to finish off the look. 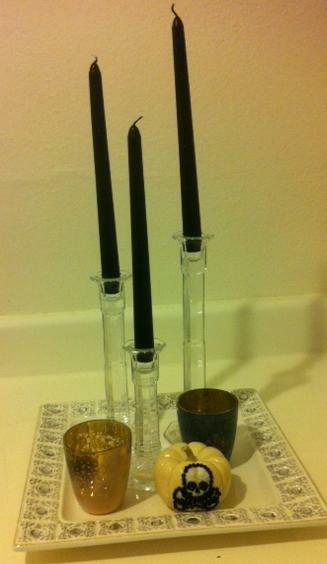 The Hebrew text was a wedding gift from Lauren’s siblings. It is a traditional document outlining the rights and responsibilities of the Bride and Groom within the Jewish faith. A ketubah is traditionally signed before the wedding ceremony by the Bride, Groom, two witnesses (in this case Lauren and Scott’s Best Man and Maid of Honor), and the Rabbi or officiant. It was displayed on an easel during the ceremony and now hangs in the couple’s bedroom as a beautiful piece of art and reminder of the commitment they have made to each other. Hope you enjoyed our Friday bonus treat! One of our favorite books growing up was called Just Like Me, a story of twin sisters. There was a recurring line in this book that described us very well as children and is a rule we still live by to this day; “Sometimes we are the same. Sometimes we are different, but we are always twin sisters.” When decorating our homes, we each have our own distinct styles, and we carry these styles through when decorating for the holidays as well. We each have our own “side” or way of doing things, which makes us unique. When designing “side by side” our two styles compliment each other. 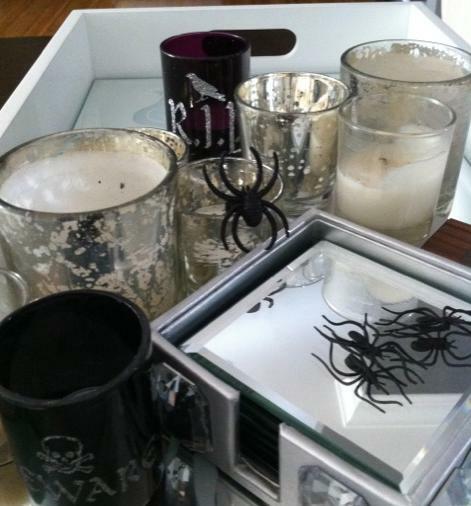 T Side (Tami): Decorating my home for Halloween is one of my favorite things to do. I just moved into a new apartment and it’s not all the way put together yet, but I still got excited about adding a few small Halloween decorations. I went with a black and white color scheme with funky skull details. I decided to try something new this year. Instead of carving my pumpkins I mod podged them. I used just a few simple materials; mod podge, a paintbrush, skull printed napkins from Party City, and stick on black rhinestones to add a little glamour. 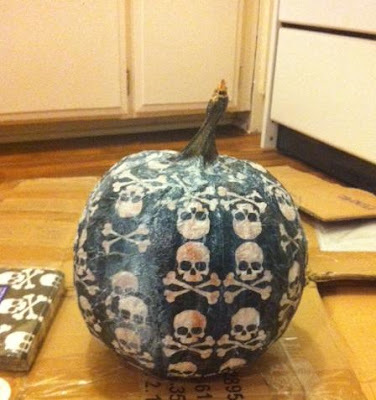 I covered this pumpkin in skull print paper and then added a coat of mod podge on top to give it a glossy finish. 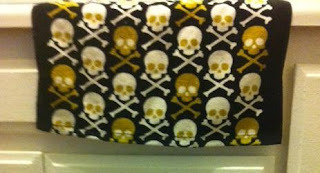 Each rhinestone was hand placed to accentuate one of the skulls and add unexpected glamour. I’m not sure where I found the time for this project (considering my apartment is still covered in boxes), but I love the way these pumpkins look! They are a funky yet chic addition to my new space. To finish off the look, I added black sparkly candles to all of my candlestick holders to set the Halloween mood. L Side (Lauren): My home is very monochromatic. Almost everything in it is dark wood, white, beige, and gray. Which makes it fun when decorating for the holidays because I’m able to accent with lots of fun colors. 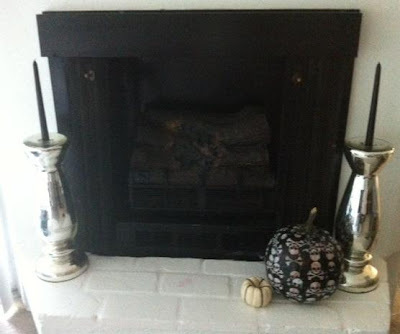 This year I went for a color scheme of black, white, silver, purple, and orange for my Halloween decor. To achieve this look I used plastic spiders including some glittery black ones, a dining table centerpiece with different colored vessels and a silver skull candle, a candy bowl filled with Candy Corn, pumpkins in different shapes and colors, and purple and black glass candle holders with Halloween sayings written in glitter. 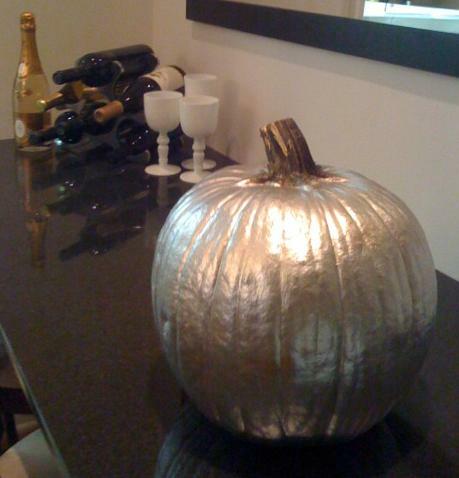 Spray painting some mini pumpkins with metallic paint will really make a statement. Sometimes Mother Nature adds her own special touch to the decorating process. This perfect web was found just outside on my patio. As you can see we each have our own style when it comes to decorating. Like the book says, “Sometimes we are the same. Sometimes we are different, but we are always twin sisters.”When decorating your space, which “side” do you relate most to?